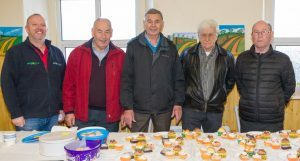 ALL the great effort injected into the latest community endeavour in Borris-in-Ossory was recognised last week at the official opening of its men’s shed after Mass on Sunday 10 March. Based in the old Convent of Mercy and renovated over the last 12 months with the help of local people and contractors, the old building is an ideal centre for a variety of skilled DIY and craft projects. It includes a mini-library as well as a social area, thanks to donations of books and magazines from local people. The formal opening was performed by Sr Regina Delaney of the Sisters of Mercy, who unveiled a plaque engraved by Roscrea stonemason Tim Ryan. ”The lights are back on in the old convent and it is only the start of great things to come with the rest of the building in the future,” said Fr Jackie Robinson, who has generously pledged €1,000 a year for three years from parish funds. Also attending were Liam Stapleton, co-ordinator of the Laois Men’s Sheds, cathaoirleach John King, cllrs James Kelly and Brendan Phelan. Nicholas Bergin – who owns the convent premises – and his parents were there, too. “The Bergin family have been so supportive since the BMS took up residence and helped us greatly throughout the renovations,” said John Phelan. Chairman Pat Dunne was the only speaker and he paid tribute to all who helped in any way with their work, time, donations and sponsorship “to help get the premises to where we are at now”. “We have spent all our monies and owe nothing, but now we have no monies; in the future we will be looking for your support again,” he said. A calendar of activities is being organised for the year and the group hopes that many more men from the parish and surrounding areas will join for just €10 a year. Mr Bergin agreed a ten-year lease with the community last year for use of the premises, which closed as a school in 1991. Opening hours are 7pm to 9pm on Tuesdays and 11am to 1pm on Fridays, but further opening hours may be on the cards. The shed is available for most kinds of repairs, restorations, renovations and purchases thereof for nominal sums.